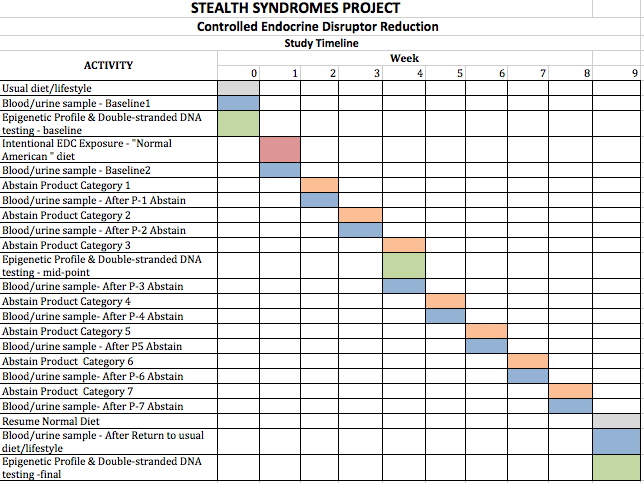 This study approves Stealth Syndromes co-founder Lewis Perdue’s protocol to determine if standard clinical blood tests can be used to detect physiological changes that may be caused by the absorption of environmental chemicals, including endocrine disrupting compounds. Dr. Reus is an internationally reknowned, and widely published biomedical scientist whose interests include neurobiology and behavior as well as the genetic origins of psychiatric disorders. Clinical blood profile assays as biomarkers to assess potential health effects resulting from the controlled elimination of suspected dietary and environmental chemical toxins. This is an interventional dietary study to determine the usefulness of carefully selected tests from standard medical blood profiles to indicate health effects which may result from the staged reduction of specific foods and substances found by published, peer-reviewed investigations to contain certain environmental chemicals. Determine whether a positive correlation exists between CEC intevention and test subject blood profiles and CEC levels in serum and urine. Because the significance of CEC urine and serum levels is controversial, the primary aim of this study is to provide a measurement of direct CEC health effects (or lack thereof) using widely available laboratory blood profile indicators. Any given product may contain multiple compounds which makes the task of identifying which compounds (or synergistic combinations) are responsible for a given health effect impractical for this study. Indeed, given the lack of health effects data on most chemicals involved, the task would be impossible for the budgets and technical abilities of the most advanced laboratories. Significantly, even less data is known about combined health effects of the everyday mixtures to which consumers are exposed. Establishment of a framework to move risk assessment of low-level Chemicals of Emerging Concern beyond traditional toxicological ervaluations and toward molecular and epigenetic evaluations.